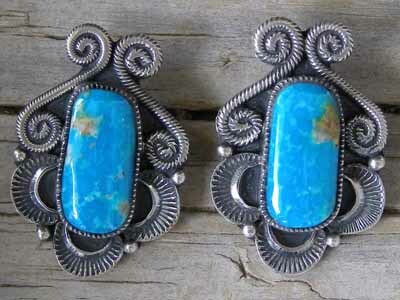 Set with Kingman turquoise stones, these post earrings reiterate the smithing style of Leon's work in bracelets and pendants. Hallmarked Leon Mtz. and stamped Sterling on back. Dimeinsions of each earring: 1 1/4" x 7/8"